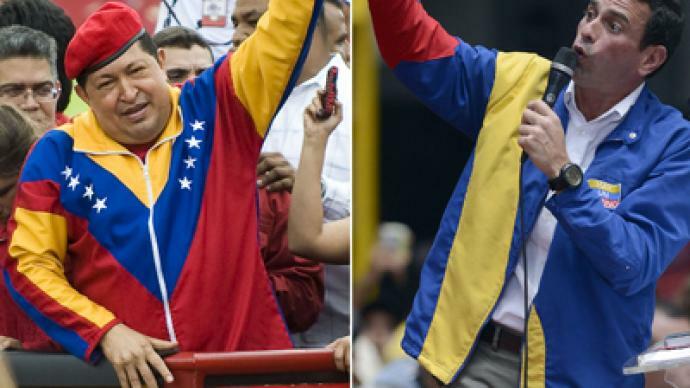 Venezuelans are electing a new president, choosing between incumbent Hugo Chavez and his main rival Henrique Capriles Radonski, the first opposition candidate in Chavez’s 14-year-rule. No other candidate is within striking distance of a win. Polling station were officially closed at 22:00 GMT (6 p.m. local time), but many stations remained open. The National Electoral Council (CNE) said the polling stations wouldn’t close until voters were no longer queuing to cast their ballot, adding it will begin issuing preliminary results when they see an irreversible trend around 9pm (01:30 GMT Monday). Both Chavez and Capriles have called on their supporters to wait for the results with patience. So far there have been conflicting reports on which candidate is leading with some exit polls favoring the incumbent and some his rival. 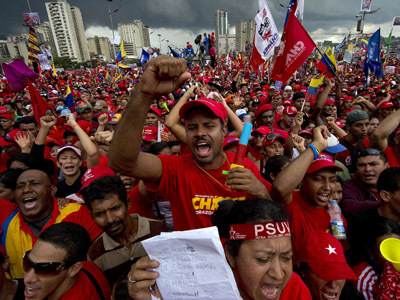 Venezuelans are choosing a new leader for a six-year term beginning February 2013. ­Analysts say that the vote is likely to be the tightest race in over a decade with 19 million people registered for the elections, 96.6 per cent of the voting population. There have been six candidates competing for the presidency in the current election. 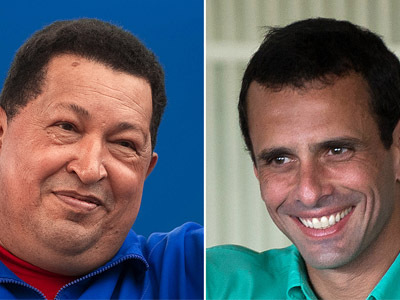 Opinion polls, however, showed it is a face-off between just two – incumbent President Hugo Chavez representing the United Socialist Party of Venezuela, and opposition candidate Henrique Capriles, representing the Coalition for Democratic Unity, the first opposition candidate in Chavez’s 13 years in power. The current leader and his young pro-US rival are neck-and-neck in the opinion polls. Hugo Chavez has received a lot of negative coverage from Western media, many regarding him as a reactionary seeking to cling to power for another presidential term. His controversial foreign policies have provoked the anger of the US on more the one occasion. He has condemned the support of the opposition in Syria and advocates Iran’s right to enrich uranium. In addition, he has been a key figure in the movement for Latin American integration and the exclusion of the US regarding internal policies. ­On the eve of the election, just hours before the polls open, President Chavez hosted an impromptu news conference to tout the country's electoral system. RT's Spanish-language channel's correspondent Jelena Milincic had an exclusive opportunity to ask the president why the West considers him to be such a threat. “When the world runs out of petroleum, only five countries, which possess the majority of reserves, will remain. Those are Russia, Iran, Saudi Arabia, Iraq and Venezuela. Apart from oil, there's a political side to the issue,” Chavez explained to RT. ”Some call it a 'bad example' – the 'bad example' of Venezuela. Of course, they call it a bad example. It was said that an American model rules and will rule the world. Do you remember the thesis by an American, Francis Fukuyama? Fukuyama's, 'End of History'. And suddenly – a surprise –Venezuela rose up against neo-liberalism when it was thought the world would only be dominated by Washington's will. Venezuela rose up, escaped the IMF, though it's not a world power,” he said. "You're asking if my victory in this election is dangerous? It could only be dangerous for those striving to dominate the world." ­In contrast, 40-year-old Capriles has resolved to radically change Venezuelan foreign policy upon election, heralding a possible strengthening of ties with the US. Born in 1972, Venezuelan politician and lawyer Capriles was mayor of Baruta Municipality of Caracas. Since November 2008 has been governor of the country’s Miranda state. “President Chavez has taken a very independent foreign policy position opposing the US military intervention in the Middle East. He has opposed the US Free Trade agreement and has been an extraordinarily influential president, fomenting Latin America integration which essentially means exclusion of the US. 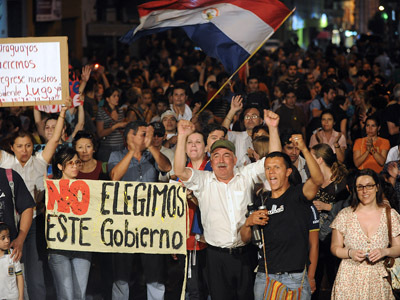 Along the lines President Chavez has been defining an alternative route for Latin America,” he said. James Petras also explained the candidates offer two different philosophies: Chavez promoting social democracy in generic sense of the word against the candidate who wants to turn back the clock to 1990s – neoliberal policies, privatization, and primacy of ties with the US. According to Venezuela’s constitution, there is only one round of voting and the one who garners the largest number of votes is the winner, in a first-past-the-post format. In July, candidates for the Venezuelan presidential elections signed an agreement drafted by the country’s National Electoral Committee (CNE), obliging them to “respect the laws which regulate the electoral process” and to “recognize the results” announced by the CNE in October. The agreement also stipulates that candidates must “compete within a climate of respect” throughout their respective electoral campaigns.